AA: During the 2009-2010 season, the Lady Lions went on to win the Big 10 “Triple Crown” in track and field and cross country. What was this experience like as a coach and for the team? Beth Alford-Sullivan: We’ve been building for a long time. On the women’s side of the program, in track and field, we haven’t finished outside the top three in the conference meet in the last nine years or so. So, we’ve had our share of being right in the hunt and getting the job done and vying for titles and giving our all, but coming up short a point or two here or there over a bunch of years. Last year during the cross country season, the team was performing very well and we had a great leader in Bridgett Franek. She was an athlete that throughout her career in the Big Ten cross country season, was poised and ready to challenge for the win. With that kind of energy coming from her and a talented group of underclassmen to support her, we really just went out and pieced it together. The core piece of it was that we won two of those championships here at home. We won our third outdoor title on the road, but we had a phenomenal setup for it. For a coach, you really have to take one season at a time. The minute they announced that we won at the cross country championships, everyone was jumping around, high-fiving and giving hugs. One of our top sprinters came up to me and said, “Coach, now we can win the Triple Crown.” I looked at her and said, “Hey, it’s still November 1st and for that to happen, it’s going to be the end of May. Let’s pace ourselves.” The team was able to say, “Hey, cross country just did their part and when we turn it over to indoor and outdoor track and field, we have to really lay it down because it’s a really rare moment in time that you’re in a position like this.” For me, as a coach, I can take each win and enjoy each one. And at the end of it, when we were in Indiana, and we pulled off the Triple Crown, it was a great feeling. This past fall and summer, [I was] really able to reflect back on it and say, “Wow, this is quite the accomplishment,” and look at the pieces of the puzzle that had to play out for us to get it done. AA: What were the main contributing factors that led the track and field team to reach such an immense level of success throughout last season? Beth Alford-Sullivan: We had a phenomenal group of people, one of them being my coaching staff. The work ethic of the staff is huge in creating success, and mine was really clicking on all gears last year. I really think that it was a situation where everything was rolling and everyone was proud of their contribution to the experience. That makes a big difference and rolls over to the athletes. However, I think the more important factor was that we were led by some really talented and successful young people. I mentioned Bridget Franek, who was our team MVP for track and field last year and was our team MVP for cross country for four years. She’s someone that led the drive. She had made the U.S. Team in 2009 for the World Championships, came back from Berlin, and then led the team to success during cross country. She won the title for cross country and led the team to the title. Then, she turned it around on the track and was a Big Ten Champion in the mile during indoor season and was NCAA champion in the outdoor season. You put together that kind of leadership along with another lady named Fawn Dorr, one of the best sprinters that we’ve had, and you get success. Fawn was a Big Ten Champion numerous times in the 400m, 400m hurdles, 4x400m relay, and the 4x100m relay. When we were done with indoor, we added to our outdoor roster a young lady name Aleesha Barber. Aleesha runs the 100m hurdles and is on our sprint relays and 4x400m. She was a former NCAA Champion in the 4x400m in 2008 and when you add that kind of power, punch, drive and momentum to the already existing leadership coming from seniors that want the opportunity to finish their careers [on] a high [note], I don’t think that we could have gone wrong; we just had great kids leading us. AA: Do you see your program matching last season’s success again in the near future, and becoming a perennial powerhouse such as Michigan or Wisconsin? Beth Alford-Sullivan: Wisconsin has the history. I ran in the Big Ten at Minnesota back in the 1980’s and back then Wisconsin was a force way into the 1990s. When you look at what Coach Peter Tegan has done, with his career at Wisconsin and Stanford, winning multiple national titles, you realize that he’s an icon in our sport. He’s retired now, but he knew what he was doing and he got it done. It was an amazing time, in the young career of mine, to see dominance like that. And then [Penn State] joined the Big Ten. When I got here, to Penn State, I had a lot of work to do to turn the program around from where it had been. At that point, Michigan was the team. Michigan had a stronghold and started to have a Triple Crown year, with strong cross country and track kids. As we crept our way into the game, we haven’t dropped out of the top three in track and field in nine out of the twelve years I’ve been here. So, from the get-go, we’ve been contenders. Right now, we have the last 3 outdoor titles under our belts and in addition and we won the Triple Crown last year. So, right now we seem to have the target on our back. It’s a great feeling. In this conference, you can’t let your hair down at all. Minnesota is charging every year—we spoiled one of their Triple Crown attempts, by winning outdoors in 2008. Michigan has a great cross country team right now and they’ll pull it back together on the track this year, so we have no room to sleep on [them]. This is the position that we’ve wanted to be in, and teams here at Penn State are known to be the people with the targets on their backs. And we just embrace it! AA: In 2004, you were named a member of the Olympic coaching staff for the Athens Games. What did this mean for you as a coach, and can you tell us about your experiences in Greece? Beth Alford-Sullivan: As a coach, it was a huge honor and was an extreme surprise. They actually publically named the staff in the summer of 2002. So, we had a couple of years of working together and preparing for the Olympic Games in 2004. It was a huge surprise! I really didn’t expect it. I served on the World Championship staff in 2001 and 2003, and the opportunity to honor my country was really something that you dream of as a kid. My first Olympic experience was watching Peggy Fleming on ice skates, taking gold in figure skating, and just wanted to be her because that’s what you did back then in Minnesota, you skated. But then in the 1980s with the hockey upset on ice—the Miracle on Ice—that had a huge impact on me as a teenager. It had a huge impact on what Olympic games were all about. Representing, competing and being able to be an ambassador for our country in a sports arena is an indescribable experience. You always have those aspirations as a kid—you want to be an Olympian. But with my talent, I didn’t pick the right genes to be that [type] of athlete. But, I made a commitment that I’d be an Olympian, which is something that I truly believed in my whole life as a young adult. So when I was offered the opportunity to represent the United States, it was definitely one of the moments that have had the biggest impact on my life. I couldn’t believe it, it was mind blowing. The fact that the games were in Greece was absolutely mind blowing too. I had, and I still call it, one of those moments in life, when everything seems to be surreal. We were in Greece for about five weeks of the summer that year. It was just an amazing opportunity to represent the United States and to work with athletes who are living their dreams. Helping these athletes to achieve what they wanted their entire life was just a huge honor. You learn so much about, not only about the competition element, but also about human nature. Seeing people achieve their goals and those that come up short, and the reaction to all the stress, is just really pretty interesting. AA: Two of your athletes have made it to the Olympics. How did they perform and what kind of satisfaction does this give you, from a coach’s perspective? BAS: In 2004, Connie Moore was a senior for me, and was just a phenomenal PSU student-athlete. She is currently running for Nike as a professional athlete. Connie had one of those senior years where everything went right. She led the team to a championship and a top-ten finish. She went on to the U.S. Olympic Trials, finishing in contention. She didn’t make the team as an individual, but instead made it for the relay pool. Being as young as she was and fresh out of college, it was a great spot for her to start. Also, it was a great feeling to have another Penn Stater with me. She, however, ended up not racing in the relay. So, she was one of those people that went to the Olympics as an alternate; it whet the appetite, but didn’t satisfy the goal. So, here we are a number of years later, and she’s still contending to make the next Olympic team. Another young person on our team is Aleesha Barber. Aleesha runs for Trinidad and made the Olympic Games in Beijing in the 100m hurdles, and did a tremendous job! A year later, in 2009, she went on to make the World Championship team, making it to the semi-finals. Just this past October, she competed in the Commonwealth Games, where she placed fifth in the finals. To see how these young people learn to manage themselves in those high-stress arenas, get better at it and progress, is great. AA: What is your philosophy as a coach? Beth Alford-Sullivan: My general philosophy is not easy to express; it has a couple of different prongs to it. For starters, I’m a big believer in coaching college athletes to develop into great young people. Often times, we have a great young person that joins us and is successful out of high school—academically and athletically—and over the four or five years that we get to work with them, we get to see and help them develop as young people. They come to us as old kids and leave as young adults. I think that it’s very important to help them in all the aspects of who they’re becoming and what they’re going to do with their lives and careers. Obviously, a lot goes on in their personal lives during their four or five years [here], and helping in all of those aspects is awesome. The second prong is to provide an atmosphere of champions. If we’re producing the opportunity for a young person to be on a team and on our roster, we want to give them an environment where they feel challenged but respected, where they feel that they can achieve their goals and be rewarded for them if they work hard, and to learn how to manage themselves in those types of atmospheres. AA: As a coach, how do you connect with your team? Beth Alford-Sullivan: As the Director, I’m able to interact with the kids at every practice. My staff and I float around and get to know the young people. We have a lot of meetings the first semester—when they’re freshman—to get to know them and make sure that they’re adjusting well, living a good lifestyle, doing things right and understanding what we’re all about. I have a lot of team meetings. If you hear one thing about Penn State, you hear about Coach Sullivan’s team meetings. We have them at least every two weeks, if not every week, during the off-season. And then during the season, we have an engaging team meeting once a week. During these meetings, you utilize that time to reinforce the values that we’re trying to accomplish here and how we want our young people to adapt to being in an atmosphere of champions, and to also let them have a chance to take ownership in what we’re trying to do. It’s pretty engaging and we spend quite a bit of time with our student-athletes outside of practice and meetings, going to dinner and hanging out sometimes. AA: Many high school coaches are volunteers. What is the best advice you can give them in helping their students achieve their goals? Beth Alford-Sullivan: Track and field and cross country are sports that takes a lot of true inner grit to survive it. There are no timeouts or do-overs. There are no substitutes. I think for young people, they must be patient. They want immediate success. It is part of our culture right now: we want it yesterday and want it double on Sunday. So, they have to be patient. They have to remember that hard work is really the key to success. If it comes too easy, then it is not as good as you thought it was going to be. AA: Is there any resource or guide that coaches should consult for workouts or guidance? Beth Alford-Sullivan: I think that there is so much online these days. There are so many different ways to skin a cat. It’s tough to say that “I believe in this training program over that” or “this is what we utilize.” Coaching is such a combination of science and art. The best thing for people to do is to research a topic, learn about it, watch videos and come up with their own ways to be successful. AA: Recently, there have been discussions in some NCAA sports about allowing college athletes to get paid. What is your opinion? Beth Alford-Sullivan: I think the way that the NCAA runs business right now is the way it needs to stay. We’re able to provide a young person with the opportunity for an education and the opportunity to be a part of a team. If you look at the volume of kids that do NCAA athletics, and the few that go on to be professional athletes, we’re giving them the opportunity to wear a team uniform and make the best of an opportunity in an amateur setting. If you start to professionalize, it changes the game quite a bit. Maybe I’m old school, but I think that they’re getting quite a bit for what they give. AA: What are your greatest memories and/or accomplishments as a coach? Beth Alford-Sullivan: The Olympics were definitely a moment in my life that can’t be beat. I would say, however, that I have a couple of other moments here at Penn State. Some of the best memories that I have are of the accomplishments of this past year, the Triple Crown, and a couple of other things that that year produced. We were also a Trophy Team at the NCAA Championships and were named the scholar-athlete team of the year. So, we had a full castle of a year. In my memory bank, this one was a huge one. It was an accomplishing year. Also, I think, apart from Penn State, I was able to be a part of the NCAA Championship win, coaching at Stanford University in 1996. I coached the women and we won the women’s national title in cross country. That same day, our men won as well. So, during the 20 years that I’ve been coaching, that was a big deal. Finally, I would say that one of the things that I’m most proud of in my career is being named the Director here at Penn State. There are very few women coaching men, and I’m probably about 1 of about 5 women across the country that has been put in charge of an entire program. I know that when my guys finally win, it will probably rank right up there with everything else! We’re getting really close to piece it together with the guys too. AA: When students come to run college track directly out of high school, what is the biggest difference? What should they prepare for or know? Beth Alford-Sullivan: I think that the biggest change for a high school athlete coming into college athletics is the volume of work that they do. In high school track, the seasons are relatively short—it starts in March and ends in the beginning of June. For most kids, they usually only participate in the outdoor season; but here, in college, we’re training all year long. So, their biggest adjustment is being in track and field for nine months versus three or four months of the year. The other adjustment is life. This is the first time that they’ve moved away from home, the first time that they’ve lived in a dorm room, the first time that they’ve had to eat the dorm food, and they’re making a lot of decisions on their own. So there are definitely growing pains that they have to face that first year. AA: Do you tailor workouts for each person on the team, or do you make team workouts? Beth Alford-Sullivan: I have five assistant coaches—one for each major area, like throwing and jumping. At the collegiate level, we’re not able to individualize every workout. So, our general conditioning of athletes and our general training of athletes is lumped together. As you get more specific, in some training aspects, like an 800m runner versus a 10k runner, we break them into smaller groups. For lack of a better expression, we take “like beings,” and train them in small groups towards success. So, it’s a combination of individual attention, but a lot of it is a group workout. AA: What’s the average training week like for your teams and how many miles are typically logged? Beth Alford-Sullivan: Everyone is individually assigned. The way that I coach, everyone has their individual guidelines and their weekly mileage is individually assessed. Depending on their backgrounds, what their goals and talent levels are, we assess where athletes need to be in terms of miles. But, if I had to guess, I’d say that the women run on average 50-55 miles a week and the guys anywhere between 75 and 85. AA: What is your favorite workout to give your team at practice? What’s the most difficult one? Beth Alford-Sullivan: I definitely have my favorites. I feel one of the best productive workouts for a cross country or distance runner is a tempo run, where they’re running at threshold pace and running for a duration of time. I like to follow that up with a two minute drill in cross country or 400/800m if they’re done during track season. So, the tempo run is a standard for me. They’re the meat and potatoes of a workout, as I like to call it. Some of the hardest workouts that I’ve ever given for the guys and the girls are 400 meter repeats during track season, 20 x 400s ahead of race pace with a 200 jog, and they’re doing each of them at 65 seconds or something like that. It’s a pretty tough workout. For the ladies, I think we just did 8 x 1000s this fall in cross country, where they’re rest is getting a two-minute jog back to the starting point. AA: How do you have your team prepare for a meet? What do you recommend? Beth Alford-Sullivan: I think that what we focus on is here, at Penn State, is that athletes have to feel fresh. There are times when you beat up your body and train hard, but in the last 7-10 days, there has to be a recovery cycle that goes on. Distance runners and endurance athletes tend to not want to lighten up. I’m not a big believer in cutting mileage. I’m more of a believer in cutting some of the intensity and making sure that you have enough days between a major workout or major race and your next performance day. We really work at trying to be recovered and freshened up. We do that a little by dropping some miles and intensity. Also, just focusing on taking care of yourself and preparing to feel good is important. This is a way to prevent burnout in athletes. One of the things that I’m really proud of here is that we have a very low injury rate, and have a really high percentage of kids that continue to run well past college. AA: Do the students from high school transitioning into your program have any problems with burnout? BAS: This is where the individual guidelines come into play. We don’t necessarily jump a kid that came out of a high school program at 30 miles a week into 70 miles a week. We would take them and progress them into 45 miles, then up to 50 miles. In general, we go from senior to freshman and kind of average down. But when we recruit, we look for the kids that don’t come from programs that are high pressure or high volume. We want to look for the kid that has a lot of emotional upswing and doesn’t carry too many years of hard, hard training under their belt—so that when they get here, they don’t get worn out from it. AA: How do you match students and their talents to events in track and field? Beth Alford-Sullivan: What we strive for is to have a balanced program. So, we’re looking for kids in all of the different events in track and field—from throwing to jumping to sprinting to distance running to pole vaulting—all 21 different events. One of the nice things that we have, versus some team sports, is that we have actual results when we recruit. We know that a kid runs this fast or throws this far or jumps this high, so we don’t have a lot of the subjective issues that you might have in other sports. We recruit nationwide, but we recruit based off performance. Once we get to know them, we have to figure out if they’re a good match for us, if they’re going to be a good Penn Stater, and if they’re going to buy into our style of doing things. If they are, and they throw far enough or run far enough, usually we’ll work our butts off to get them to come to Penn State. AA: What attributes do you seek in your athletes and do you encourage walk-ons? Beth Alford-Sullivan: Yes, we encourage walk-ons. We’re a program; again, whose philosophies encourage both the development of students as athletes and as people. The sport of track and field, as you may or may not know, doesn’t have enough scholarships to cover everyone. The women have about 18 and the men have about 12.5. Bottom line is that you have to have some development and some walk-on kids that show some talent and promise down the road. The next thing you know, a year or two later, they’re a big player for you! AA: As an Executive Committee member of USA Track and Field (USATF) and the President of U.S. Track & Field and Cross Country Coaches Association (USTFCCCA), what are some of your responsibilities within these organizations? 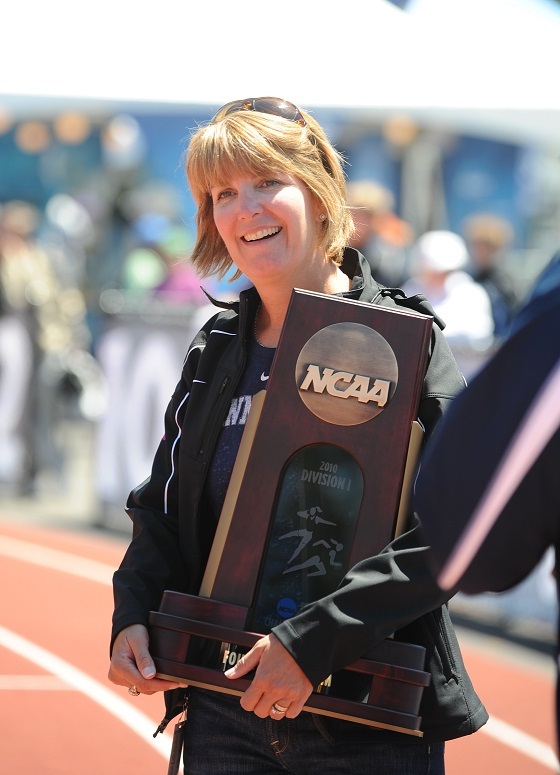 Beth Alford-Sullivan: Currently, I am the Acting President of the USTFCCCA. I have been thrilled with this organization and the leadership in this organization has been outstanding. Our CEO has done a tremendous job of upgrading the association and we’re accomplishing quite a bit. As the President, my easy answer to you, in regards to what I would like to see in our sport, is figuring out our outdoor championship format. We’ve had a lot of different ways to get to the NCAA Championships. A lot of that has been dictated to us and a lot of that has been controversial amongst all the 300 plus coaches trying to figure out what the best way to go is. So, I hope that we can lock and load on that. The other organization is the U.S. Track and Field (USATF), which is our professional national organization and governing body, and is part of the United States Olympic Committee (USOC). It doesn’t deal with any of our collegiate issues; it deals with our post-collegiate and professional athlete issues. Currently, USTF is going through a lot of leadership issues. We are going through quite a bit of growing pains. I have been on their committee for many years and the Board just fired the CEO there. Honestly, what I would love to see is for USATF to get some quality leadership and continue to promote us and produce the greatest track and field team in the world as we enter into every Olympiad. So, I’m hoping that we’ll get there and keep that dream alive. AA: Are you frequently a guest speaker, or do you help conduct coaching courses through USATF? Will there be a time/place where athletes and coaches can come hear you speak? Beth Alford-Sullivan: I haven’t officially done anything where I’m on a continuous circuit. I have been invited to different clinics and have had many different opportunities to speak. But, I don’t currently have anything that is permanently on my schedule year in and year out. AA: With such a successful career and so many coaching accomplishments, how do you stay grounded as a coach, and where do you see yourself in the future? AA: Thank you for your time and good luck this track and field season. 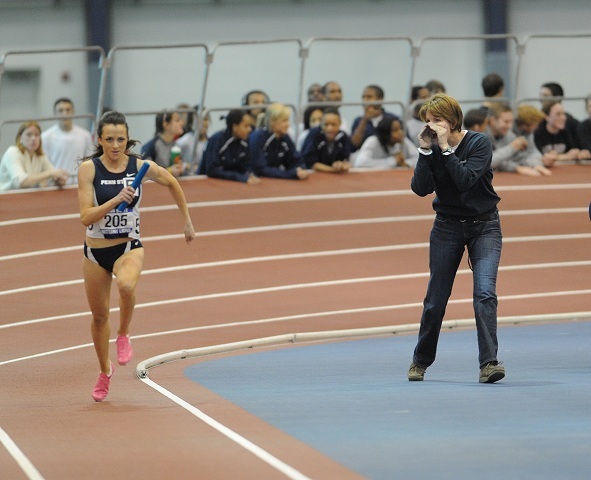 For more information about Beth Alford-Sullivan, you can visit her coaching profile at GoPSUsports.com. On behalf of Access Athletes, we would like to thank Beth for taking time out of her busy schedule to do an interview with The Real Athlete Blog.